The Initial Response Incident Commander is responsible for establishing the initial Command and managing the initial response to an incident. 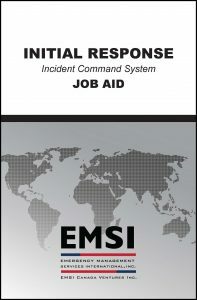 Designed to fill a critical gap in initial response ICS training, this course focuses on the roles and responsibilities of an Initial Response Incident Commander either in the initial stages of a more complex incident (Type 3 or greater) or in managing a Type 4 or 5 incident. Building upon ICS-200 concepts (ICS for Single Resources and Initial Action Incidents), this course prepares response personnel to assume command in the initial response and establish a solid incident management foundation upon which follow on actions can be based. This course is an instructor-led training that supports learning through discussion, lecture, and active participation in multiple exercises that provides a realistic, hands-on approach to mastering the skills required of an initial Incident Commander. Initial Response Incident Commanders who may serve as Incident Commander in the initial stages of a more complex incident (Type 3 or greater) or for the duration of a less complex incident (Type 4 or 5).